In Cosmopolitanism and the Age of School Reform, noted educationalist Thomas Popkewitz explores turn-of-the-century and contemporary pedagogical reforms while illuminating their complex relation to cosmopolitanism. 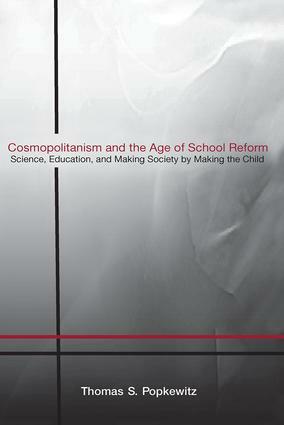 Popkewitz highlights how policies that include "all children" and leave "no child behind" are rooted in a philosophy of cosmopolitanism—not just in salvation themes of human agency, freedom, and empowerment, but also in the processes of abjection and the differentiation of the disadvantaged, urban, and child left behind as "Other." SCIENCE AND GOVERNING THE PEDAGOGICAL "SOUL"
CURRICULUM STANDARDS: RE-CALIBRATING THE SCOPE AND ASPIRATION OF INDIVIDUALITY IN "THE SOCIAL"
Thomas S. Popkewitz is Professor of Curriculum and Instruction at the University of Wisconsin-Madison.